Stilettos & Grace: Fashion Questions? I'm speaking on fashion/confidence/beauty this coming Friday at a women's event. So, I thought I'd ask my readers, what are some of the questions you would want me to answer if you were in the audience? Is there anything you struggle with or just plain wonder what people are talking about when they bring it up? Is there something you wish someone would shed some light on or give you permission to do/not do? And if you don't want to be public about it in the comments, feel free to email me. I'd really love to hear your thoughts. And maybe I can answer some of your questions right here on this blog! Jeans. If tapered legs supposedly look so terrible, then why are they in the stores? Explain scarves. How can I use them and not feel ridiculous? Decorative to warm. I am going to be thinking of more. How fun is that!!! I want to hear ya! Is it in San Diego? Color combination. What is some color "no no's"? I see people put the strangest color combination together and yet it looks so cute. I think you should talk about capris. I need to find that post where you talked about lengths. Oh, and there is this pretty gal in my small group who is thin with huge nonies, and she wears the BAGGIEST clothes. Something about confidence (and wearing clothes that fit) would help her, and I'm sure others as well. Oh, and jeans with no belts and lots of crack. Ugh. You should say something about that. AND the super-tight shirt stretched over the post-baby belly. Not a good look. Warn them. AND people just NEED to know that although clothes come in all sizes, there are some styles that just should not come in a Large. Certainly not an Extra Large. Those retailers are just cruel for offering them. Need a co-speaker? I'll be the reality check lady. Forgot to mention the cleavage issue. It drives me NUTS when ladies show off their girls in front of my husband. That MUST be addressed. 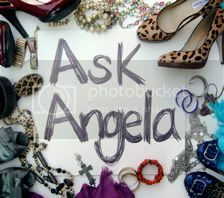 How fun Angela, wish I could be there to listen to you! You got a lot of great questions! Can't wait to hear how your speaking engagement goes!